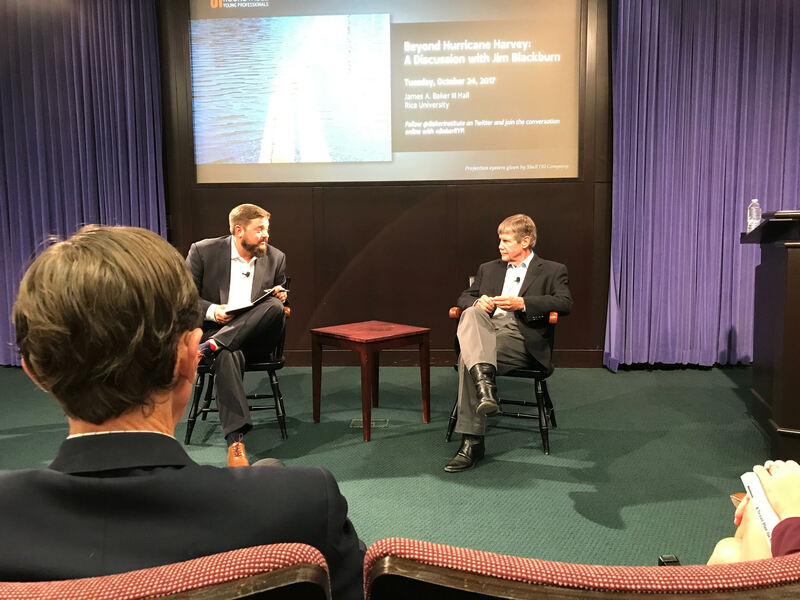 On Tuesday evening, just as the Astros took the field for game one in Los Angeles, I had the pleasure of attending a Baker Institute event at Rice University featuring Dr. Jim Blackburn. 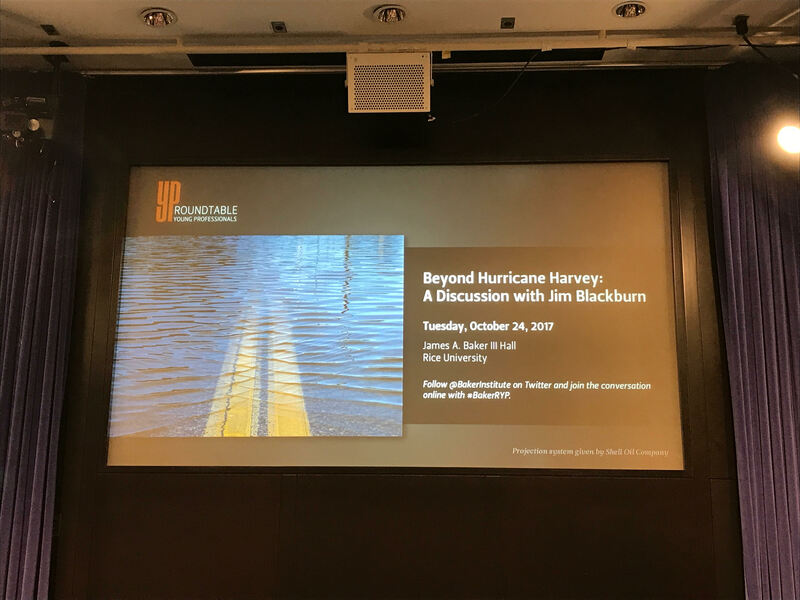 “Beyond Hurricane Harvey” was a discussion and Q&A with Blackburn, who is the co-director of the Severe Storms Prevention, Education, and Evacuation from Disaster (SSPEED) Center at Rice. During Tuesday’s event, Blackburn basically laid out his vision for how we need to discuss and tackle Houston’s flooding problem from this point forward. Many of these ideas were incorporated by Harris County Judge Ed Emmett in the plan that he unveiled on Wednesday. Nevertheless, here is a summary and some of my takeaways from Tuesday’s event. As a quick note, Blackburn has published two papers in the wake of Harvey. Much of what he covered Tuesday night is covered in these papers too. The first addresses initial policy ideas after Harvey. The second describes the public/private non-profit entity described below. Both are very informative and useful reads, and I would encourage our readers to get involved in this. As I said in my own Harvey post-mortem: It is now time for a new generation of Houstonians to work out new solutions to this complex problem. Turning point: Blackburn opened by calling Harvey a turning point in Houston’s history. This is basically our moment to get this right. We all know we live in a city that is prone to flooding. We can never stop that from happening, but we can manage it in ways that will reduce the financial and human toll that has accompanied recent flooding events. Houston has an opportunity now to become the world leaders at weather and climate resiliency. While showing a chart of hurricane tracks impacting the Texas coast, Blackburn related the story of Indianola and Galveston. Indianola was wiped out by a hurricane in 1886, and we know the story of Galveston after 1900. Blackburn believes that Houston’s future as a leading American and global city may hinge on what we are able to accomplish over the next several months. If we bungle the response to this disaster, we could be looking at a steady economic decline in our region. Blackburn referred to this situation as a new “Jesse Jones moment” for Houston. Speed couldn’t be emphasized enough. We need to get these solutions moving now, while the wounds from Harvey (and previous events) are still fresh and raw. The longer we wait, the less likely we’ll accomplish meaningful action. 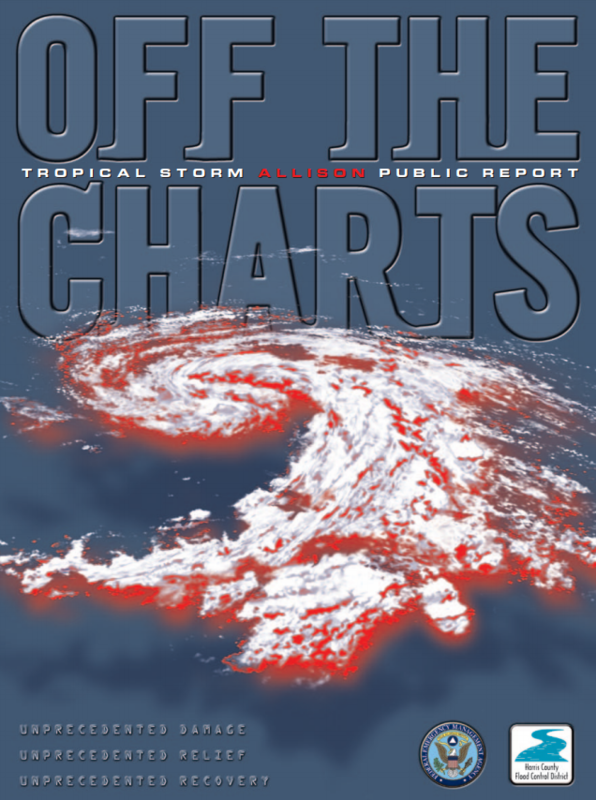 Amusingly, Blackburn shared the “Off the Charts” report published by Harris County Flood Control after Tropical Storm Allison in 2001. Here we are again. We need a vision, a plan (we seem to have those moving forward), and now we need to mobilize the public and persuade our elected leaders to take action immediately. Blackburn was asked whether Houston’s infamous lack of zoning contributed to the problems from Harvey. He made the point that it was not a major cause, but what is a problem is the typical, almost “closed door” nature of Harris County government. Lots of items get addressed really quickly without much discussion at various county meetings. The population of this area is also somewhat agnostic toward government participation. We’re not engaged enough. For problems as big as this, everyone needs to be firing on all cylinders, taking politicians to task, asking questions, demanding transparency. It’s easy to be cynical, but in this situation, it’s important not to be. Watersheds: Blackburn emphasized that we need a watershed level approach to problem-solving. For example, what works well for the Buffalo Bayou watershed may not work well in Sims Bayou. Each solution to mitigate Houston’s flooding needs to be tailor-made from watershed to watershed. We need to make room for the bayous. We’ve built too close for too long. Now we need to amend that. New flood maps: Much of the newer construction in Houston floodplains has been built only with restrictions for the 100 year floodplain. Blackburn believes that given the FEMA flood maps are now obsolete, the Harvey flood footprint should be the new standard for restricting development. These points resonate with me as a meteorologist. You don’t need to be a climate change “denier” or expert to realize that the Houston area is in some kind of new reality. We really don’t know where things are headed in the future, or maybe we’ve just done a poor job truly understanding our area’s flood risk. We do know though that the 100 year and 500 year maps are essentially obsolete at this point, they should be redrawn, and Harvey’s footprint should be the benchmark by which we consider new development (or abandonment) going forward. Buyouts: Harris County (and others) need to buy properties that have flooded. That obviously requires money. But this program needs to continue and expand. Old reservoirs: Addicks and Barker Dams absolutely need to be repaired. They have been listed as two of the six most “at-risk” dams in the country. It’s important to note though that much of this has less to do with their structural integrity as it does the population that would be impacted should a failure of either of the dams occur. During Harvey the releases from Addicks and Barker were equivalent to a 500 year flood event into Buffalo Bayou. Ostensibly this was done to ensure structural integrity held up in addition to preventing even worse flooding. The bottom line is that Addicks and Barker did their job. Our region did not, by allowing development so close-in behind the reservoirs. One problem Blackburn readily points out is that the Army Corps of Engineers, who run the dams, makes it very difficult to get information on the risks and health of them. There are inundation maps that exist for a dam break, but most people cannot see them, typically because of the “national security” rationale often employed by government agencies. Blackburn would like to see a congressional hearing on these two dams for some answers. I think that’s more than fair. New Reservoir: One of the likely culprits of worsening flooding has been explosive development on Houston’s west side. The advent of Grand Parkway is allowing for more former prairie land to be converted into impermeable surfaces. Blackburn argues that we do more for people who haven’t moved to the area yet than we do to protect those currently living here. A third reservoir should be built in northwest Harris County to relieve pressure on the Cypress Creek watershed, as it aides in causing problems in Addicks after big rain events. We saw it in Harvey, and we saw it during Tax Day 2016. The third reservoir would have minimal issues in terms of displacing current property owners, as most of the land it would sit on is currently undeveloped. Flooding non-profit organization: One of the more intriguing ideas that I felt was presented by Blackburn was the idea of a non-profit type organization here in Houston that is dedicated to flooding issues. This would allow for an independent voice to speak for residents and businesses of the area. It would allow for the private sector to become more engaged in helping to develop solutions. Government needs to step up, but so does the private sector. These problems cannot be solved without their help and input. The organization would work to help advocate for change in Houston and how we think about flooding. It would also do very useful things like produce a “Guide to Living With Houston Flooding,” which would help new residents and property owners understand their flood risks. The non-profit would advocate for a new, state of the art flood warning system in Harris County, among many other things. See more here. Ike Dike: Obviously with all the talk around Harvey, we occasionally forget that it’s not the worst-case scenario hurricane for this region. Blackburn offered some thoughts about building the so-called Ike Dike off Galveston, as well as the slightly cheaper Mid-Bay gate option. A worst case 20 to 25 foot storm surge event today (with a powerful hurricane passing south of where Ike tracked in 2008) would likely destroy over 100,000 homes in the Bay Area and flood another 200,000 of them. Industry on the Houston Ship Channel would be crippled, which would have enormous economic ripple effects nationally. The environmental damage to Galveston Bay from a storm like that would be utterly catastrophic and almost incomprehensible. Investing in those solutions would significantly mitigate the damage from a hurricane of this type. The fiscally conservative among us may scoff at the billions of dollars price tag, but the reality of the situation is that this storm is going to happen one day. Would we rather be insured for it or not? Because right now, we aren’t insured. One of the critical features the Ike Dike needs to have, according to Blackburn, is drawing-power. In other words, in needs to be a destination unto itself. The Netherlands is the prime example of modern, successful flood control. Their flood gates can be tourist destinations when they close. A Galveston Bay barrier would need to be something like that too. It would be an engineering marvel that would both protect and serve the community. Is this going to take a long time to build? Yes. Blackburn suggests we get the environmental permitting process done now while the funding is worked out behind the scenes. Conclusion: I found Blackburn’s discussion to be extremely engaging and interesting. He is full of very good ideas, but these ideas are going to require a lot of time, energy, financial commitment, pressure on politicians, and, most of all, public engagement to implement. Eric and I are committed to keeping this topic front and center in everyone’s consciousness. This problem isn’t going to improve until we actually act on it. To our loyal readers, we would encourage you to share our posts and the links we’ve shared in them with your social networks. We can either choose to live with the status quo, abandon Houston, or work constructively to make Houston the model city in the world for resiliency and adaptation. Houston and surrounding communities are our home. We need to take care of it. With other communities around the country and world likely to have to grapple with changing climate, sea level rise, and more people living in vulnerable places, I think Houston should work to be the example other cities will strive to emulate. Thanks for sharing, I would have liked to attend that. I’m in Harris County proper but basically live in Galveston County. The Non-profit is intriguing because if you could get Harris, Galveston, and Brazoria working together there might be enough tout to get these things done. Building on slabs is cheap but not easy build above grade. Perhaps a return to pier and beam foundations in the building codes. Most of the flooding could have mitigated by a rise of just 1 or two feet. Great meeting! How does one participate in future such meetings at Rice University’s Baker Institute? I fully support ways to adapt versus the blank checks being asked for to “control” weather and climate. I assume Harvey will cause a pause to growth, as people move out and companies and individuals become hesitant to relocate here. But how big is too big? I can’t imagine a metro area of 9-10 million subjected to annual floods as being in any way viable. Metro Houston had 3.5 million people when I moved here, and we seemed to be getting along fine. I agree that a regional plan and multi-faceted coordination is needed across our table-top region. We can all agree that the term “100 year flood plain” is not only misunderstood by the public, but has been rendered meaningless by Mother Nature. The public tends to think of averages as “normal” and forget the extremes and wild swings that get us to those mundane stats. This is further exasperated when you consider our recorded history is a blip on the radar of earth’s history. By it’s very nature, weather is wild and untamed, and blows through our predetermined and assumed limits all-too-frequently. This is further complicated as vast swaths of land are developed at astonishing rates by our burgeoning economy. When do we move from 15 point plans to actual specifics? While we need time to get it right, Houston needs to get this started. What changes will occur when? I think I’ll measure success when I see that the streets stay clear when it rains 1-2 inches in 1-2 hours every second week in the summer. Thank you for your thoughts Matt! 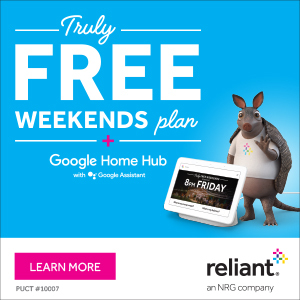 My dear Fulgencio and I discuss such things from time to time as we love our community here in Houston and want to make sure all of our property is protected and safe from future floods. While discussions like this are scary sometimes (especially for Fulgencio) they are necessary. Matt, Thank you for your coverage of our event, and for your and Eric’s ongoing commitment to addressing this issue in Houston. For anyone interested in hearing about future Baker Institute events, they can subscribe to our newsletter here: https://www.bakerinstitute.org/newsletter/. Most of them are open and free to the public. Given that economically speaking we ought to be better off avoiding an otherwise inevitable if unpredictable catastrophe in the Ship Channel, it is not fiscally conservative to reflexively oppose the project simply because it involves government spending (and by implication increased future taxation). Should the project be scrutinized and audited to ensure that it is run as efficiently as such a massive undertaking should be? To ask the question is to answer it. The fact of the matter is that, if begun, the project will almost certainly run into delays, cost overruns and change orders. One might hope that wouldn’t be the case, but anyone who thinks these things can be avoided (most hilariously if they think they can be avoided if only the project were ‘run like a business’) or, when these things occur considers it a valid reason to have originally objected to the project, is either simplistic or duplicitous. Mayor Turner was a state legislator for decades. Where are the examples if his legislation reforming the Harris County Flood Control District into a regional watershed authority? Where are the audits of HCFCD to assure it was not playing games with Flood Zone designations for developers? For the last 3 Mayors, Brown White and Parker, at best lip service was paid to dealing with aging and poorly designed infrastructure. We permitted developers and governments to increase new tax bases while placing existing citizens and their homes at risk. This catastrophe, where watershed level flooding is a regular event was decades in the making. Our regional weather is doing what it always has. We collectively allowed a folly of massive proportions to take place. There’s lots of talk about buy-outs, but it should have happened yesterday if it was going to make a real impact. People need to figure out what to do with their homes, and with no buy-out offer on the table, many will forge ahead with plans to rebuild at the same level, because it’s what they can afford to choose. The opportunity to make sweeping changes in neighborhoods is already passing. All the city of Houston seemed to care abiut was holding us as tax hostages to shake down Austin. Yet other area cities are working to soften the burdens on flood victims. Houston city government really needs an attitude adjustment, frankly. Any talk about pipes going from Addicks/Barker to the gulf? For extreme events.